Description: 9/21/97: SD70MACS like the BN godz intended! 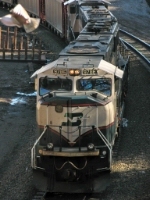 BN nose logos...Westbound unit coal train empties...I MISS those days....Why didnt I appreciate them more! Description: Holding westbound on the CSX mainline at Pine Junction. Description: Z-STPCHC pounds thru downtown Stoddard behind a pair of MACs. Description: The race is on! Who is going to win? Description: Loaded coal train C-SCMCRD0-03A is seen south of Hemingford, Nebraska. 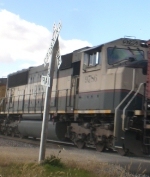 The power was BNSF SD70Mac 9786, BNSF ES44ACs 5925, with 6130, and 6108 as the DPU. Title: BNSF 9786, CP's Tomah Sub. Title: BNSF 9786 Heads up a Eb coal load. Description: heading into Cameron IL then into galesburg.